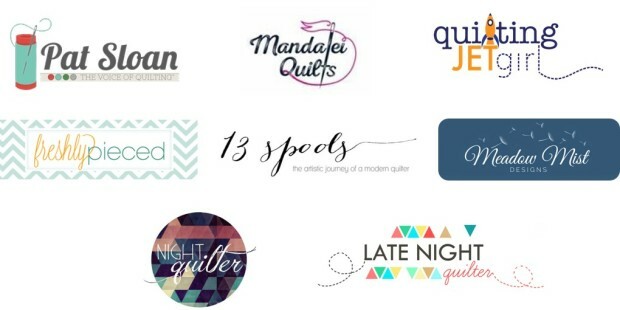 On Tuesday, my friend Stephanie @Late Night Quilter (who was also one of the co-hosts for the 2015 New Quilt Bloggers Blog Hop) launched an Indiegogo campaign for her brainchild, the Quilter’s Planner. I am so excited about the planner and immediately pre-ordered two of them (they will make the perfect gift for other quilters or creatives in your life)! I would like to share some of the details about the planner today. Stephanie designed The Quilter’s Planner to have everything you need to organize your life, plan and track your sewing projects and be inspired to create something beautiful every day! It is approximately 8 x 11, made in the USA, and will be shipped in time for the holidays. Personally, I am a huge fan of the fact that the planner is bound so that it can fold. This is the kind of feature that really shows me that Stephanie has put a lot of thought into how the planner will be used. 8 full quilt patterns from amazing designers (Cheryl Brickey (Meadow Mist Designs), Yvonne Fuchs (Quilting Jetgirl), Amy Garro (13 Spools), Lee Heinrich (Freshly Pieced), Mandy Leins (Mandalei Quilts), Pat Sloan (Pat Sloan), Kitty Wilkin (Night Quilter) and me). Check out the awesome, original block design in the left hand margin (this example is the Whirling Plus design by Josi Heron of Avocado Quilts). Each weekly spread will show a fabulous block design by a blogger in our quilting community – that’s 52 block designs to inspire you throughout the year! 52 original quilt block designs… I am so excited about those! Our 2015 New Block Blog Hop was a smashing success. If you can take a second of your time to help me spread the word about the planner, I would appreciate it so much. You can log on to Indiegogo and use the share tools in the left and right margins. If you use the share tools on the Indiegogo site, you will be automatically entered into my Indiegogo Share contest. The friends who share the most (because sharing is caring) will receive rewards from me like a free planner, a fabric bundle, or a fun t-shirt! There are lots more details about The Quilter’s Planner on the Indiegogo campaign page. I am a person who loves to make lists and cross items off of lists, and I am curious to see how The Quilter’s Planner integrates into my life next year. 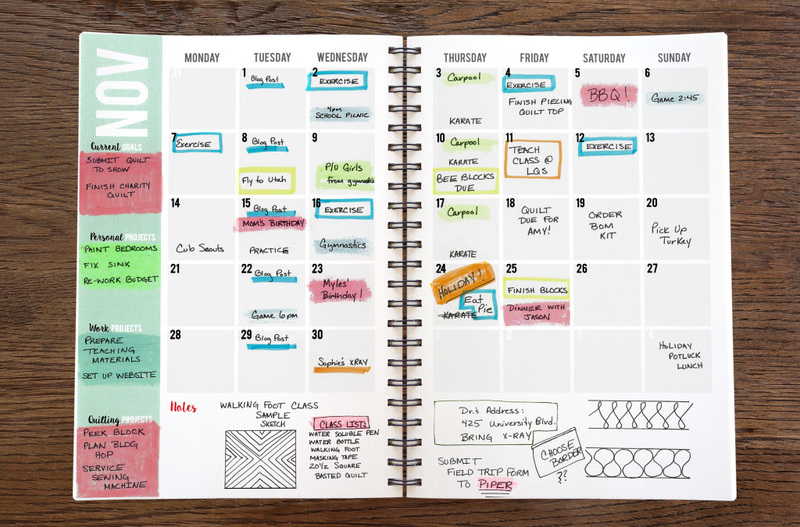 Would a planner like this work for you, or do you prefer to use other tools / methods? I’m a list maker too. There’s something so satisfying about crossing an item out! I picked mine up too and looking forward to seeing how it fits into my everyday life. The best part of the first image is Thanksgiving says “Holiday, eat pie.” My plans exactly. 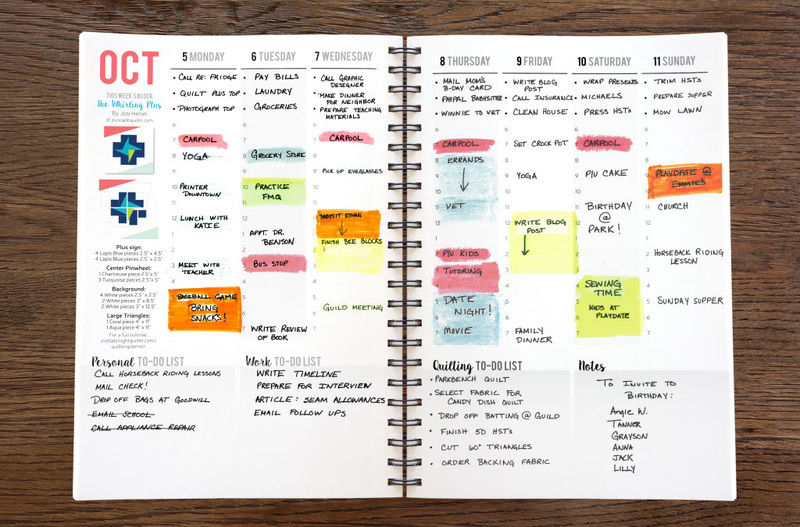 I used to use a day planner, but with the craziness and chaos that children added to my life I found I wasn’t writing things in it, forgetting it at home, or in the car, etc. So I started using the google calendar and syncing it with my phone so I could add things from home or on the go. Our new challenge is that Matt has started scheduling things (like bike rides, or gym workouts) without clearing them through the event coordinator’s (my) calendar, and we’ve started to occasionally double book. So now I’m thinking about having a family calendar that would sync to his device too. 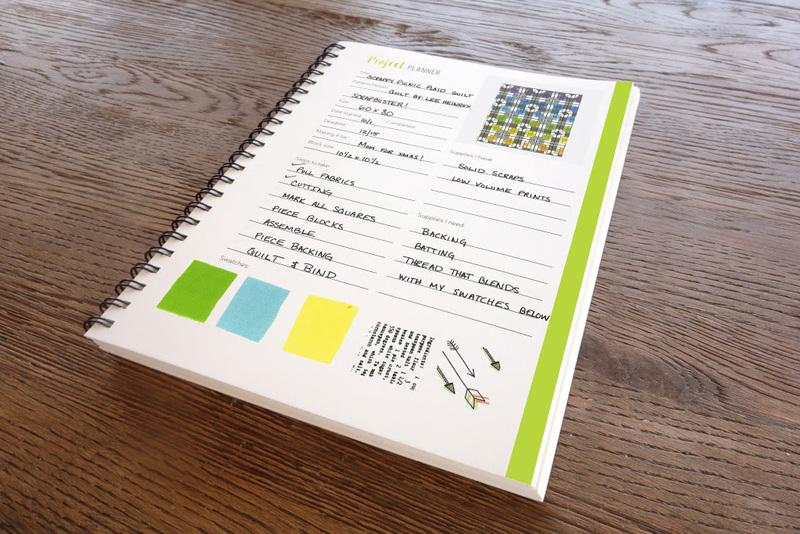 But I keep all of my quilting and blogging stuff on little papers in my sewing room, and the more I think about it the more I think that this day planner might be a good way to keep track of everything and keep it all together. My guild is trying to get a group of 15 together for the group buy…we’re up to 4, so we’ll see. Yvonne, I first want to congratulate you on being chosen to have your patterns in Stephanie’s planner! Of course, I think you design fabulous quilts and easily can see why she chose you as one of the quilt designers. Spectacular for both of you. I have never given much thought to a planner and with my severe memory problems it is a 50/50 chance either way. Thank you for sharing and have a wonderful creative day! I was so very tempted to order a couple – one for me and one for a friend for Christmas – but the exchange rate and shipping (to the opposite end of the globe) are not currently my friends. 🙁 It looks like she has raised more than her target, which is great news. I resisted for a few days, but then just decided I had to have one. Another really good idea, clearly the quilting blog world is filled with creative, entrepreneurial people! I’m not sure whether a planner would work for me, in some ways it would, I like an actual physical list to cross things off, but then I like to flit around sometimes with my making, and some projects sit for a long, long time without progressing, so possibly an organised central list like this might nag my conscience too much, and rather than it persuading me to be more systematic I have a horrible feeling I might just accidentally on purpose bury the planner under a pile of WIPs! I wish there was an app that would sinc with my ipad, phone etc.. as I have to use an electronic scheduling software for my business / life. Hello! Wonderful planner! It would seem that the links at FQS are either not working, or the planner sold out? I was wondering if that is the case, when it might be available again. Really fantastic design! Thanks!